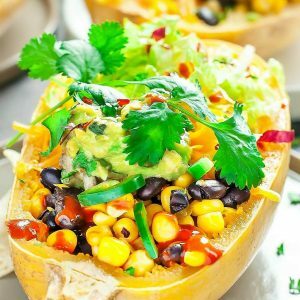 These fully-loaded Spaghetti Squash Burrito Bowls taste just like Chipotle's tasty burrito bowls and are loaded with healthy whole food ingredients! 1-2 cups protein taco meat, grilled chicken, rotisserie chicken, turkey, or taco-seasoned tofu - choose your favorite! Feel free to add more of your favorite toppings or mix-ins if there's room! Anything goes in love and burritos. Slice your spaghetti squash in half lengthwise and scoop out the seeds. For easy slicing, feel free to stick each squash in the microwave for 5 minutes to soften it up just a tad. The knife slides through much easier this way! Score! To prevent sticking, rub the cut side of the squash with a teeny bit of olive oil or simply place a little water inside your baking dish. Both work great! Place your squash halves inside a baking dish or atop rimmed, lined baking sheet [some liquid will escape] and roast face-down for 30-40 minutes, or until tender and easily pierced with a fork. Cooking time will vary a bit depending on the size of your squash, and the once rock-hard exterior of the squash will be visibly softened. While the squash are roasting, prep your veggies and/or meat, as well as your toppings and sauces. This is a fabulous way of cleaning out the fridge and can easily be customized based on what you have on hand. Have fun with it! Once squash are ready, allow to cool enough to handle and fluff the "spaghetti" strands with a fork. Pile high with all your favorite burrito bowl toppings and mix-ins and dig in! Want a smaller serving? Stuff one spaghetti squash instead of two! My general rule of thumb is that each small/medium squash boat is a perfect single-serving. I wouldn't stress measurements too much; simply load 'em up with healthy whole foods and you're good to go!Serving a crowd? Make a GIANT burrito bowl for everyone to share! Serve this sassy squash up casserole style, piled high with all your mix-ins and toppings OR arrange all the ingredients in little bowls and let everyone customize their own burrito bowl. Anything goes!